Dingle Bay, Monday 6th Sept ’10. We had a great group from the Brehon Hotel and Valley Suites, Killarney on Monday. At the Crow Rock we started fishing for Mackrel, got some there for bait. The day was calm F2/3 sunny the views at the shore from the boat were spectacular. 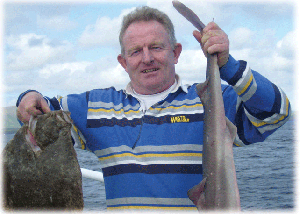 We then steamed for about 30 minutes to the Wild Bank on the outer edges of Dingle Bay. Immediately, using squid jigs we were hooking large Pollack. Saithe were abundand but small so we dropped the lures to bottom quickley to avoid them. This worked, now we were on Cod & Codling. One of the guys Peter decided to bottom fish with the Mackrel cut in strips as bait. Within 10 minutes he was hauling 1 kilo Wrasse and Pouting. At the end of the evening on our way back to the Port of Dingle we say large splashes about 1 mile south of us, these turned out to be Fin Whales ‘lunge feeding’, what a sight. Out again Friday, will update you.